We are unable to modify orders that have already been submitted. We cannot add products, change the product order, change the quantity of the product or change shipping address or shipping method once orders have been submitted. If you've placed an order and realize it is incorrect we can cancel the order if it has not already shipped and place a new order. How do I cancel my order or a product within my order? Please contact Red Cross Store customer service at 1-833-733-7763 or email request to support@redcrosstraining.org. The center is available Monday – Friday 7:30 am – 10:00 pm EST. Please have your order number ready. If the order or a specific product within the order has entered the shipping process the product or entire order cannot be canceled. The Red Cross Store has a 30-day return policy for Training Supplies, Books & DVDs, Emergency Preparedness and First Aid items and a 90-day return policy for Apparel & Accessory items. All unwanted items must be in new, unused condition. Refunds will be issued to your original method of payment within 15-20 business days after receiving the return to our warehouse. Electronic Textbooks and other digital materials are non-refundable. Some clearance items may be final sale and thus non-returnable. Any item that is final sale will include a note in the item description. Once you receive your order from the Red Cross Store, please open the box(es) and inspect your order even if you do not intend to use the supplies immediately. If there is any error in your shipment or if you are missing products from your order please contact customer service (833) 733-7763 or support@redcrosstraining.org. In case of a shipping error, packing error or defective item, you will receive a refund of the entire product price on the original form of payment as well as the shipping cost. To return the products contact the customer service center for a prepaid shipping label. All ZOLL, Philips and Physio Control branded AED (Automated External Defibrillator) units, AED training units and accessories must be returned to the manufacturer. Please call the manufacturer (number provided below) to receive your RMA (Return Merchandise Approval). Only Red Cross branded AED training units and accessories can be returned in accordance with the store return policy. The Red Cross Store has a 30-day return policy for training supplies as stated above. What if I change my mind after the return deadline and my product is NOT damaged? Returns and exchanges on Apparel & Accessory items will only be accepted 90 days after your order was originally shipped. Returns and exchanges on Training Supplies, Books & DVDs, Emergency Preparedness and First Aid items will only be accepted 30 days after your order was originally shipped. What if I miss my Return Packing Slip - where can I download the return packing slip from? What if I want to do a partial return? If you are dis-satisfied with the fulfillment of a part of an Order, Red Cross Store will refund the product prices of the returned products. What is the process for returning merchandise? 2. Include the (1) return form and (2) copy of your original order confirmation in the return package. 4. Once we receive your return, we will refund (or credit your invoice) your order, excluding the original shipping charges. You will be notified via email once your return has been processed. Where do I find my order confirmation number? If you have the original packing slip, this information will be contained within the document. If the document has been lost, you may go to https://www.redcross.org/store and login with your user credentials, Go into "My Account" and navigate to the Order Details History Page. Find your order and print out the page or add the confirmation number to the generic packing form. What are my shipping method cut-off times? For any Order being shipped by "FedEx Priority – Next Day or the 2nd Day", all orders must be submitted latest by 2:00 PM EST of the same day. For any Order being shipped by "FedEx Ground" or with "USPS", all orders must be submitted latest by 4:00 PM EST to be shipped by the End of the Next Business Day. For All International Shipment Orders being shipped by "FedEx", all orders must be submitted latest by 2:00 PM EST to be shipped by the End of the Next Business Day. For any LTL or TL Orders, all orders must be submitted latest by 4:00 PM EST to be shipped by the End of the Next Business Day. When can I expect my apparel purchase to ship? Apparel items require 4 days prep time in addition to the shipping method chosen. For example, if express 2-day shipping was placed on an apparel time, please allow for 6 business days (4 business days to prep the apparel item and 2 business days for priority shipping method chosen). When can I expect my first aid kit/emergency kit to ship? Certain first aid and emergency preparedness kits are built to order due to their components. These kits require up to 2 days preparation time in addition to shipping time to deliver. This information will be indicated on the product page underneath the order quantity field. Most products sold on the Red Cross Store do not come with a warranty. Damaged or defective items should be returned for a full refund or replacement. What is your warranty policy regarding - AED Training Devices? 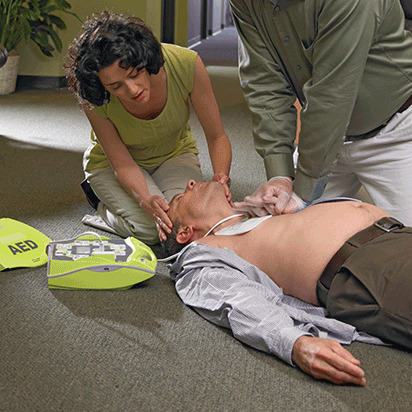 American Red Cross AED training devices have a 12-month warranty. Customers may be required to confirm the lot number on the back of the AED training device in order to return or exchange defective devices. Please note that the 12-month warranty applies to the AED trainer only, the AED trainer pads do need to be replaced periodically once they no longer adhere to the manikins. Eton emergency products can be returned or exchanged with the Red Cross Store within 30-days of receipt. After 30-days, consult the enclosed warranty to determine how to return or exchange a defective radio directly to Eton. If you purchased an earlier model that is now discontinued contact Eton directly at www.etoncorp.com. What is the shipping policy for wallet cards? Wallet card orders received before 3pm EST Monday thru Friday (excluding holidays) will be shipped the same day. Wallet card orders received after 3pm weekdays or on the weekend or a holiday will be shipped the following business day.